To use third-party app, Instagram users can head to their profile and select “Settings” from the menu. Instagram has rolled out non-SMS, two-factor authentication support for Android users, according to a report on The Verge. This means the authentication system will work with security apps like Google Authenticator and Duo Mobile to generate a secure login code. Users will not need to rely on SMS for this. The feature was made available for Instagram on iOS earlier this year. To use third-party app, Instagram users can head to their profile and select “Settings” from the menu. Next, choose “Two-Factor Authentication” and select “Authentication App” for enabling third-party app for two-factor authentication. For users who already have an authentication app installed on their device, Instagram will automatically find the app and send a login code to it. People will have to then open the app to retrieve the code and enter it on Instagram for turning on two-factor authentication. 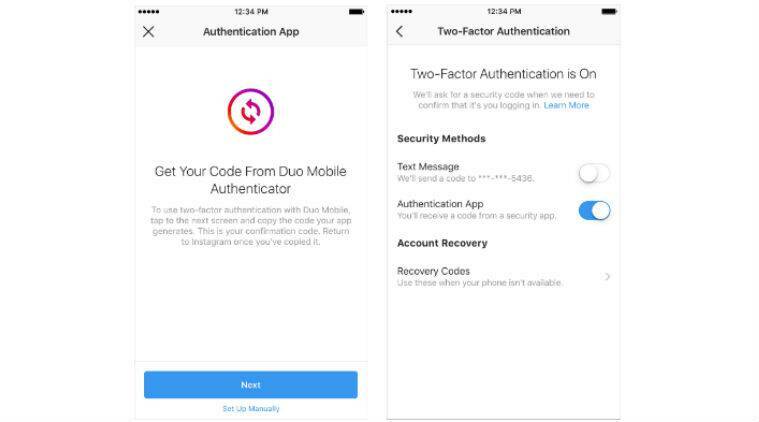 Instagram users who do not have any authenticator app installed on their device, will be redirected to App Store or Google Play Store to download the authenticator app of their choice. Once installed, users can enable two-factor authentication via third-party app from the Settings menu of Instagram. Earlier this year, Facebook modified its two-factor authentication system to allow users to use third-party apps to secure login via desktop or mobile. Facebook users can enable two-factor authentication by going to Settings>Security and Login.